By now, many fast food chains have learned -- sometimes the hard way -- not to provoke the wrath of Wendy's notoriously savage and generally hilarious Twitter account. But on Tuesday, Burger King may have done exactly that when it introduced its first-ever spicy chicken nuggets -- a move clearly aimed at taunting the pigtailed burger chain, which recently discontinued its own spicy nuggets. Yes, BK just went there. While Burger King didn't go so far as directly mentioning Wendy's on Twitter (probably out of fear), the arrival of the new spicy chicken nuggets at its Whopper-slinging locations nationwide this week came with a side order of straight-up trolling its redheaded rival IRL. Specifically, the company bought a billboard ad (shown above) right next to at least one Wendy's restaurant, reading "SPICY NUGGETS ARE BACK" and "only at Burger King." Damn, that's cold. 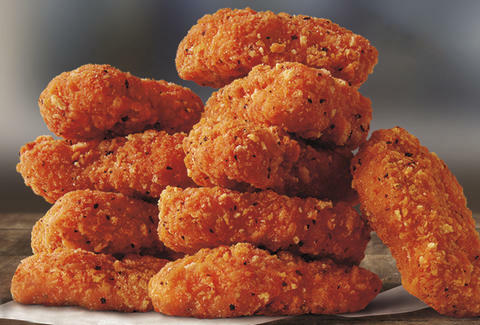 Of course, it's worth pointing out that Wendy's still serves its beloved spicy chicken nuggets in at least seven cities. But it's clear that Burger King is hoping to capitalize on Wendy's general lack of spicy nugs and, well, humiliate it in the process -- at its own risk, of course. The nuggets will be available at most Burger Kings across the country for a limited time and while supplies last, according to a press release. The chain has also launched a promotion that serves as another not-so-subtle jab at Wendy's. 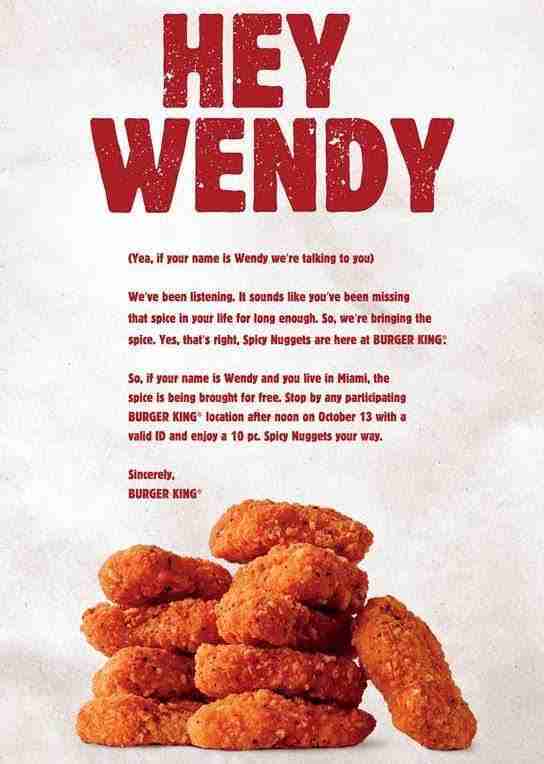 As if to rub one of those little salt packets in its wound, Burger King is giving free 10-piece orders of the spicy chicken nuggets to anyone named Wendy at some of its restaurants in Los Angeles, New York, and Miami on October 13. If your name is Wendy, all you have to do is show up after noon (local time), show your ID, and the nuggets are yours. Pretty savage, right? Whether or not Wendy's will clap back at Burger King with its signature fury via 140 characters remains to be seen. On the one hand, purposely ignoring the stunt could very well be the harshest way to respond to the heavy-handed stunt. On the other hand, Wendy's is almost as good at full-blown Twitter smackdowns as it is at making square-shaped cheeseburgers. Tony Merevick is Senior News Editor at Thrillist and can't wait to see the antics unfold on Twitter. Send news tips to news@thrillist.com and follow him on Twitter @tonymerevick.